Now this week I’m surrounded by the brush fires in Los Angeles and haven’t been able to go out for days due to the smoke and ash. Believe me, I’m grateful my house isn’t in danger but it’s amazing how so many of us are affected even though we live miles away from the actual flames. 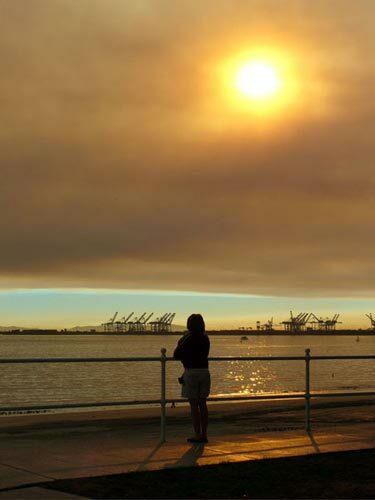 This photo was taken at the beach 2 blocks from my house in Long Beach… ash was falling like a light dusting of snow and smoke burned my eyes… the fires in Corona and Yorba Linda were about 20 miles away but the winds brought the smoke overhead, blocking out the sun and making Noon look like evening. This entry was posted in Environment, General, Politics, Surfing and tagged brush fires, Long Beach, Los Angeles. Bookmark the permalink. I still paddled out to El Porto. I didn’t have the oppurtunity to paddle out for a month and I finally had the chance. I felt like it was worth it and I wasn’t the only one.